Sarah was born and raised (mostly) in Houston, Texas, with a few brief stints in Alaska, Canada, and Australia as a small child, and Austin while she attended The University of Texas. Sarah followed advice from her Dad and began working in restaurants in high school as a hostess. He told her if she gained restaurant experience, she would always be able to find a job. Little did he know this small piece of advice would end up shaping her passion for the food and beverage industry. Sarah worked a variety of jobs in restaurants while studying to be a pharmacist at UT. Her passion for the industry grew so much that she left The University of Texas to pursue and eventually obtain a Bachelor of Science degree in Culinary Management from the Art Institute of Houston. Her science and math minded brain really proved to be a great asset while attending culinary school. Sarah has been cooking professionally for six years at a variety of restaurants ranging from food trucks to fine dining establishments in Houston. 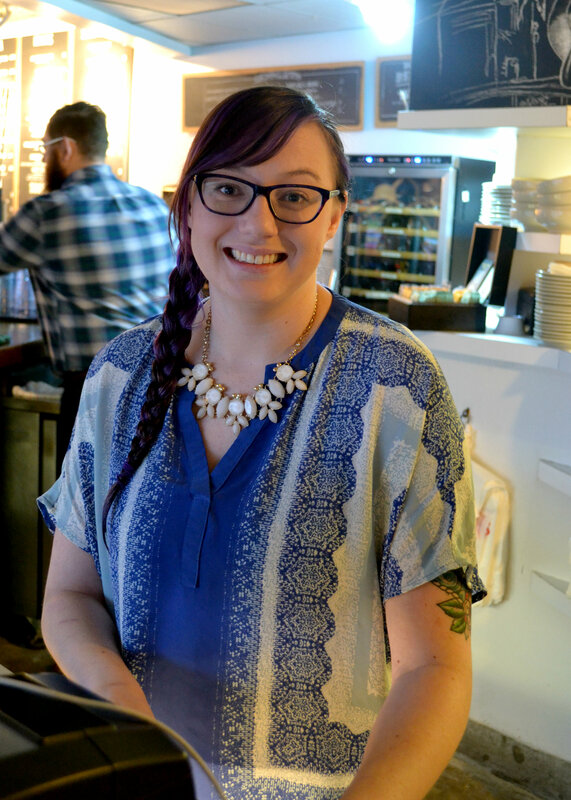 No stranger to the front of house, Sarah decided to transition from the kitchen to the counter at Paulie’s to learn different aspects of the restaurant industry from the talented staff and management at Paulie’s. She loves the environment of Paulie’s, as well as utilizing her ability to multi-task. One day she hopes to open a 24 hour diner in Houston, or an oyster shack on the beach in northern California. When she isn’t at work, you will most likely find Sarah drinking an espresso and a vanilla flat white at Southside, or slurping ramen noodles in Chinatown. She loves reading and collecting cookbooks of all varieties. In her spare time Sarah loves cooking for her friends and family. Her all time favorite thing to make is risotto. She has made risotto at least once a week for over four straight years. She also loves baking (and eating) desserts of all kinds. She loves spending time with her boyfriend, who is also a chef, and her siamese ragdoll cat Roux. When she finds time to get away from the restaurant for a few days, Sarah enjoys traveling to see her favorite bands Phish and Modest Mouse. Sarah loves living in Montrose, and is definitely enjoying her short commute to work at Paulie’s! This entry was posted on Wednesday, January 21st, 2015 at 2:43 pm	and posted in Uncategorized. You can follow any responses to this entry through the RSS 2.0 feed.